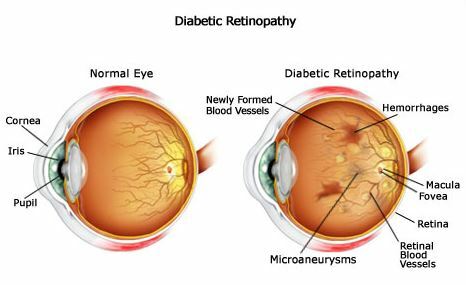 Diabetic Retinopathy refers to the changes in the retina that occurs over a period of time in diabetes. Your retina is the back part of your eye made up of light sensitive cells. It is fed by blood vessels and when the blood vessels change it can start to cause vision problems. The blood vessels become fragile and start to break and once the blood leaks out it can affect the vision by creating areas of blurring or floating spots in the eye. These spots may disappear with time. Later the blood vessels may stop carrying blood permanently and the cells will start to die. This loss in sight is gradual but permanent. As the old blood cells die, abnormal cells will grow taking their place. These cells are unable to nourish the retina properly and may grow into the transparent inner part of the eye and further deteriorate vision.